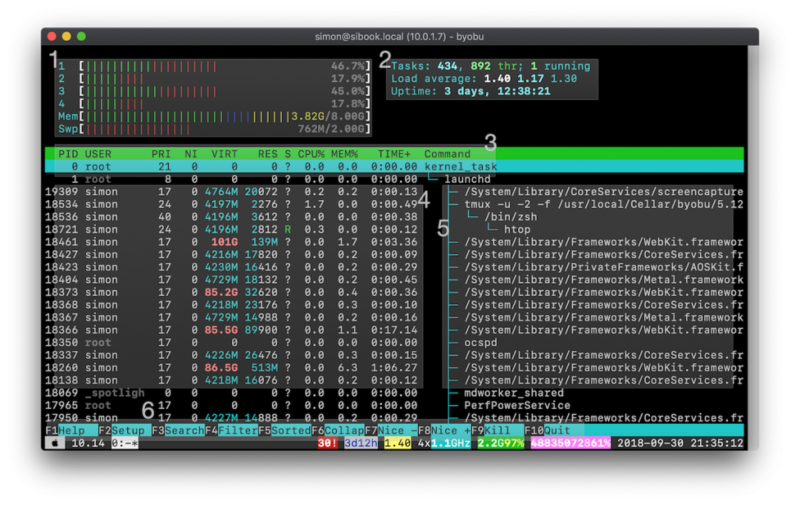 If you've ever logged in to a Linux server to check what's going on, you're probably using htop, a text-based system monitoring tool for Unix based systems. htoprunning in a byobu session; hover over to view explanations. Displays the CPU usage (each CPU core gets a line, my CPU was 4 hyper threads = 4 lines). For CPU: Green = user apps, red = kernel usage. For memory: blue = low priority; yellow = IRQ. Displays the amount of processes and threads, load average (1, 5, 15 mins) and the system uptime. Has the columns. How to add more is shown below. The process path and name. See below for shortcuts to display environment, etc. Menu items: mouse can be used in addition to F keys, if enabled. While htop is a text-mode application, on most terminals, you can actually use the mouse to select processes, press the menu keys and navigate the Setup menu. With the SPACE key, you can select multiple processes. You can them kill them via F9. To view the environment variables of a specific process, just navigate to the process via the arrow keys and press E.
Set IO priority via I. List open files with lsof with L.
Per default htop shows threads of non-system programs, but this can result in the list being very verbose (leading to a bunch of duplicate program names) and hard to navigate. To turn that off, simply go to Setup > Display Options and check off both "Hide kernel threads" and "Hide userland process threads". Alternatively, kernel and user threads can be toggled with K and H, respectively. To select and view a specific users' processes, type U. This entry was posted on Sunday, September 30th, 2018 at 20:28 and is filed under Articles. You can follow any responses to this entry through the RSS 2.0 feed. You can leave a response, or trackback from your own site. Electron: How did we get here? Note: Your comment will be shown after it has been approved.